Aston Villa fans were left in no doubt whatsoever as to Paul Lambert’s intentions for the group of players who have become known as the club’s ‘Bomb Squad’ with the announcement of the squad numbers for the new season. And surely the biggest name being shown the exit door in no uncertain terms by Lambert is the man who is still by a considerable distance the club’s record signing, Darren Bent. The striker has been on borrowed time at Villa ever since it turned out that Christian Benteke was really rather good at this football lark, and was recently stripped of his number nine shirt and demoted to the nether regions of the Villa squad list at No.39, a move that sums up the direction his Villa career has gone over the last nine months. Bent’s response was a rare public venting of frustration on Twitter. “Gutted to lose my No. 9 shirt. Unfortunately one of those things I have to deal with. KTF”. Though he sticks by his “keep the faith” mantra, those words must ring hollow for him at the moment, as he has become increasingly ostracised at the club who broke the bank to sign him just two-and-a-half years ago. The purchase of Bent for an eventual £24 million was an uncharacteristic extravagance by Randy Lerner in January 2011, and an extravagance that has not come close to being repeated since. It was a huge statement from Lerner, and a great show of faith in then-manager Gerard Houllier. Villa were toiling in seventeenth position, only out of the relegation zone on goal difference, and had been struggling for goals throughout the first half of the season. Lerner clearly recognised that this was the sort of signing that the club had to make to ensure their survival. Bent was (and still is) a proven goal scorer. With a goals-to-games ratio of 0.4 at Ipswich, 0.47 at Charlton, 0.32 at Spurs and 0.57 at Sunderland, it seemed certain that Bent was the man who could get Villa out of trouble. The price paid to Sunderland for Bent’s services was no doubt an inflated one, but ironically, for many Villa supporters, the England international was the striker they always considered the final piece needed for Martin O’Neill’s Villa team, before the former Villa manager had his transfer credit line cut off by Lerner. It all started so well. Villa fans had a new hero after just eighteen minutes of Bent’s Villa debut when he scored what proved to be the winner over Manchester City at Villa Park. Bent went on to finish with nine goals in sixteen games for the club in 2010-11, and, to be frank, his goals were probably what saved the club from the drop. He scored both goals in the 2-2 draw at Goodison Park, the equaliser in the 1-2 win at Upton Park, in the 1-1 home draw with Stoke, and both goals in the marvellous 1-2 win over Arsenal on the penultimate day of the season. Without those goals, Villa would have seriously struggled. It was under Alex McLeish that things started to sour for Bent at Villa, as the new manager’s insistence on implementing a defensive 4-5-1 formation isolated the centre-forward (often by a distance of around fifty yards) and utterly starved him of the support that a player such as Bent desperately needs. The fact that Bent still managed to score eleven goals by the start of February is indicative of his natural goal-scoring prowess. However, the issue was that he has never been a striker who creates and scores his own chances – he relies heavily on the playmaking of others from midfield, and ideally requires a different type of centre-forward to play alongside, things he was never really given under McLeish. Bad luck played its part too, undoubtedly. After scoring in four consecutive games in January and early February, Bent ruptured his ankle ligaments in a dour away draw at Wigan, an injury which prematurely cut short his season. Two weeks later, Andi Weimann burst onto the scene by scoring his first Villa goal as a lack of attacking options forced McLeish’s hand. Bent didn’t help himself at times, however. Most notoriously, there was the incident in December 2011 when the striker was photographed out shopping in Cambridge whilst supposedly recovering from injury and while his team-mates were losing 0-2 at home to Liverpool. An LAX-bound Keane says bye to Bent, who also wouldn’t play for Villa for the rest of the season. After the arrival of Lambert, Bent was initially given chances. Named during pre-season as Villa’s captain in Stiliyan Petrov’s absence, he scored in the League Cup win over Tranmere in August, and in back-to-back games in late September. 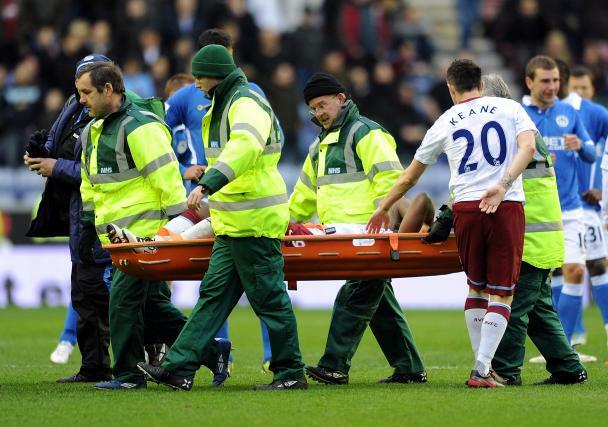 However, injuries took their toll on Bent again in 2012-13. He picked up an ankle injury in training in early November, and was substituted in the first half of the 1-4 win at Carrow Road in the League Cup in December with a hamstring problem that saw him miss the entire Christmas period, a hectic run of fixtures in which he surely would have played some part. He scored on his return in the FA Cup win over Ipswich in early January, but was sidelined again after picking up a knock in the first leg of the League Cup semi-final. In late February, Bent then injured his foot in training and did not return to full fitness until early April. Although his persistent injuries meant that he was never able to find any consistency or to string together a run of games for Villa last season, perhaps a larger factor was the fact that he once again failed to adapt to a change in system at Villa. It quickly became obvious that Lambert’s preferred formation was an effective 4-3-3, which meant formation that was ultimately unsuitable for Bent. From being forced to play up top with a huge chasm between himself and the flat Villa midfield under McLeish, he would now be required to link up with the attackers playing just off him, bringing them into the game whilst also looking to create his own chances. Bent has never really been suited to this style of play, and by this point of course, Villa had found somebody else to do this job. The revelation of Christian Benteke foreshadowed the end of Bent’s Villa career from relatively early on last season, as Lambert never really showed any interest in playing the two centre-forwards together – which is perhaps a shame in some ways, as it could be argued that Benteke is exactly the kind of attacking partner with which Bent would have flourished. As well as the tactics Lambert prefers to play at Villa, repeated spells on the sidelines had something to do with Bent never really having a chance to strike up a partnership with Benteke, but it was obvious from early on, that Villa’s manager didn’t fancy Bent as his first-choice striker, and Lambert taking the captaincy away from Bent after just four games of the season and passing the responsibility to new signing Ron Vlaar was ultimately a sign of what was to come. But Bent was hardly candid in talking about his feelings with respect to being stripped of the role of captain, or about being dropped so early in the season. “At first I was shocked to get the captaincy, but I was delighted with it. Then I was shocked to lose it. It was disappointing but I have to get on with it. It’s the manager’s decision – he appointed me captain and then took it away. “That’s down to him, but it’s frustrating for me. And to score my first goal of the season then be out of the team the following week was also a shock. And in an interview with the Daily Star in May, it seemed that his patience, rather unsurprisingly, had run out. Trying to get Lambert to commit to giving his true thoughts on how Bent actually fitted into his plans though, would prove a fruitless task for the press when they encountered the Villa boss. In many respects, Bent is perhaps right to feel hard done by. But above all, perhaps, is the fact that Bent simply does not fit the model of what Lambert is doing at Villa. At the age of 29, it seems extremely unlikely that Bent’s game will improve much further, and any club signing him ahead of next season will be probably be getting his final years as a high class of striker. Add into the equation his wages (reportedly £65,000-a-week), and the fact that the club need to offload high-earning members of the ‘Bomb Squad’ before they entertain bringing anybody else into the fold of Lambert’s Villa revolution, makes undeniable sense. With Lambert adding Nicklas Helenius to the ranks of Benteke, Weimann, Jordan Bowery and academy graduates such as Jack Grealish, all under the age of 23, Bent is certainly surplus to requirements in terms of Lambert’s philosophy of youth. Throw in club stalwart Gabby Agbonlahor as the experienced striker at the age of 26, and who is still showing that he can make crucial contributions to Villa’s seasons, this looks like a pretty promising set of attacking options for the foreseeable future. Still, it would have been unthinkable when he signed that Bent would find himself so brutally surplus to requirements. All in all, though, Bent deserves to be remembered well at Villa. Until he became overshadowed by Benteke’s explosive first season, he was undoubtedly Villa’s first-choice centre-forward, and he ended with a pretty respectable strike rate at the club, with 25 goals in 64 games in a Villa shirt. Whoever Daren Bent’s new club may be (at this point it looks likely to be either Fulham or Newcastle), they will undoubtedly be getting a proven goalscorer, but one who needs to be played in the right way in order to maximise the abilities he still possesses. Good luck DB9, and thanks for the goals. Strictly my personal opinion : Lambert is really making progress with villa? ?I never felt Villa as a good team under him..substandard transfers other than Benteke and Vlar..winning games only when the opposition plays very poor..poor midfield where Villa was powerful always..overhyped youngsters (just average and not even a single so called high rated villa player is outstanding like luke shaw, sterling, coutinho etc. )..lambert is dictator styled manager who is looking for so called hungry players – actually getting really poor players (poor = hungry may be)..Always felt he is afraid of star players even from the lower league(never seen bidding any star youngsters from lower leagues) which he afraid of affecting his dictatorship..What I see is a above average attacking team of gabby and benteke who runs and runs and runs where all others including defence keep on tackling and giving the ball away frequently..very much worried about the future of Villa as if any of youngster plays above average consistently shift to bigger clubs due to the managing style of Lambert and Villa management.!!! Wishing a royal return of Villa to the top of European football in the very near future.. I genuinely wish him all the best – he plays – he scores – he will never “track back” – never be captain material – Lambo – you knew that really didn’t you?? – but he scores, ala last game at Wigan – good luck DB – and thanks.